Armyworms are common caterpillars that prefer lawn grasses over other plants in your yard. When present in large numbers they appear to march in army-like formations, migrating to areas of fresh grass. These caterpillars are about 3 cm (1 inch) long. I’ve noticed something lately. People are consistently amazed when nature intrudes on their lives, as if it’s a great exception to some law that states “nothing unusual should ever happen to me.” Whether it’s hurricanes or a snake in the house, or something as mundane as a caterpillar outbreak, the usual reaction is astonishment. That seems to be the common thread among callers this week with regard to the latest fall armyworm outbreak. I say “latest,” because fall armyworms are nothing new. According to Dr. Allen Knutson, extension agricultural entomologist in Dallas, fall armyworms are present every year; however, this year they are a widespread problem for hay producers and small grains producers across the state. “I’ve had calls as far west as Wichita Falls, south to Comanche and across east Texas,” he said. Locally, my turfgrass colleague, Dr. Lindsey Hoffman, and I have gotten many calls this week from concerned lawn owners, schools and reporters in the north Texas area. The caterpillar stage of a drab brown moth, fall armyworm is known scientifically as Spodoptera frugiperda. It feeds primarily on grasses, though it has been reported feeding on dozens of non-grass plants and weeds. It earns the name “armyworm” from its habit, during times of major outbreaks, of marching, army-like, across fields and roads and yards, consuming everything in its path. This is one of those years. Fall armyworm caterpillars can vary in color, but generally have three yellow dorsal stripes; an inverted, white Y on the face; and three stripes on the plate just behind the head. While some farmers may be hit in the pocketbook by the outbreak, homeowners don’t have much to worry about. Armyworm damage in home lawns can be breathtaking, but it does not usually hurt the lawn in the long-term. Because armyworms feed on the leaves, and not on the critical roots and stolons, a little irrigation or a rain should restore lawns to their original condition within a week or two. Fall armyworm will feed on most common lawn grasses like bermudagrass and St. Augustinegrass. Lawn browning often appears to occur overnight, though armyworms need three to four weeks of feeding to do their damage. The last week or so of the larval stage is when most of the feeding, and damage, occurs. If you want to treat for aesthetic reasons, standard residual insecticides like bifenthrin, cyfluthrin, permethrin, esfenvalerate, or carbaryl should quickly eliminate an armyworm invasion. These products are best applied as a spray; a hose-end sprayer is a convenient applicator. Organic gardeners should either leave the infestation to run its course, or treat with the natural insecticide, spinosad. The organic gardener’s other favorite caterpillar spray, Bt, can kill armyworms but has a very short life on the grass and will be less effective than spinosad. 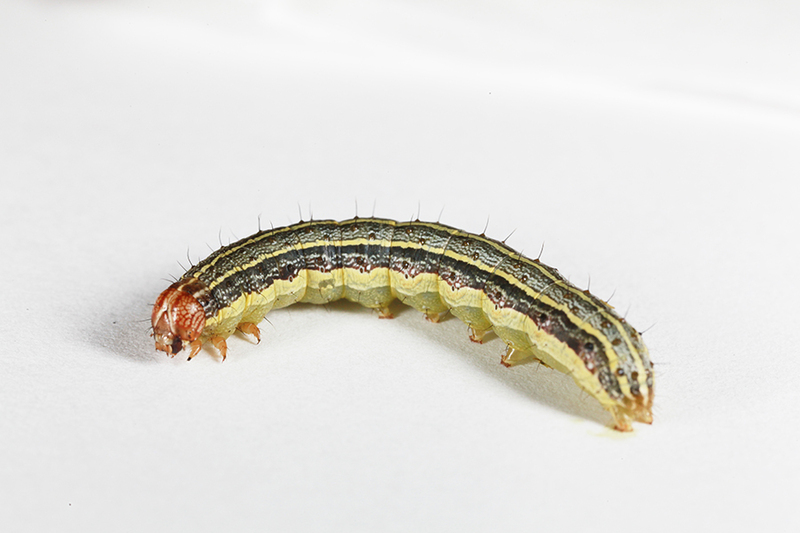 Fall armyworms differ from many other caterpillar pests in that they do not survive the winter in areas where it freezes. In Texas, they probably survive winter only in far south Texas. As a result, whether you treat or not will have no effect on whether you are likely to see this caterpillar next year. This entry was posted in Pests of landscapes and tagged fall armyworm, lawn insects, pest control, Spodoptera frugiperda. Bookmark the permalink.